Congratulations to Dave on the fifth anniversary of his Mechanical Pencils Blog. 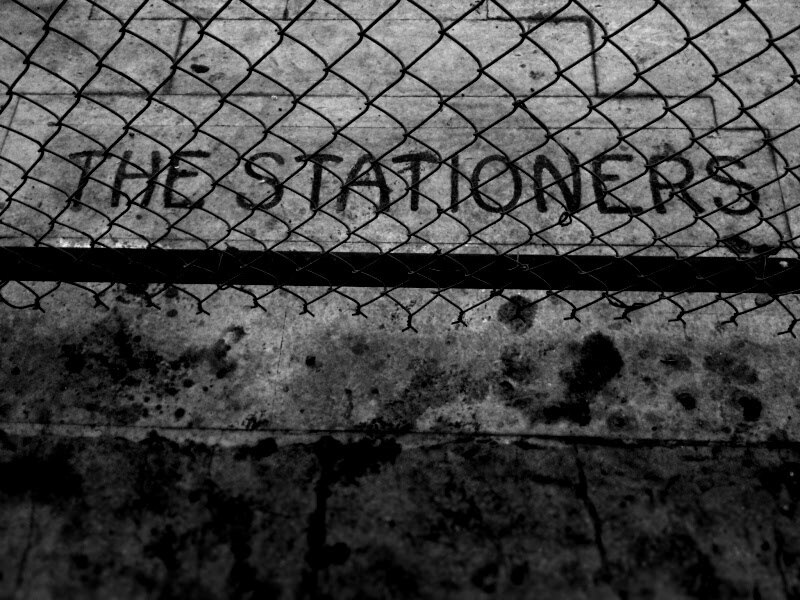 His was one of the first pencil blogs I found in the internets, and it sets the standard which I have no hope of matching. Thank you very much for your contribution the pencilblogosphere, Dave! The page-view counter has ticked over to 10,000 views, not all of them my own. Thanks for looking. I have more posts in the pipeline. I still need a new ribbon for my Olympia SM3 so no typecast from that yet; needless to say, though I will anyway, The Stationers That Shall Not Be Named did not have a ribbon in stock. I have been using it to type notes for a work project onto 3x5 index cards, with some success. Even though the notes are strewn with typos and are not perfectly aligned with the feint ruled lines, it's a pleasure to read them. Soon I will post some notebook-related blogposts, once I've thought of something to say. Note Booker, Esq. kindly sent me his Metaphys 44133 notepad memopad to review, and I've already had a bit of a play with it. My children were fascinated by it, when the Metaphys arrived in the post last week. It really is tiny. Denmark is known for many things: bacon, the world's oldest national flag, and Lego spring immediately to mind. It has a long-established stationery industry which has provided the world with Viking pencils, and of course Bantex everything else. Less well-known however, is the Linex company. This is rather surprising as it was, according to the company's own website, established in 1935. After a period of ownership by Bantex in the 1990s, it was spun off again as an independent company by Groupe Hamelin, which acquired Bantex around the turn of this century. Linex manufactures well-made plastic stationery goods, principally rulers, stencils and templates, and geometry tools. I own a few of them, including a very nice circle template, a metal eraser shield and a 5mm lettering stencil. Linex also specialises in tools for marine navigation. 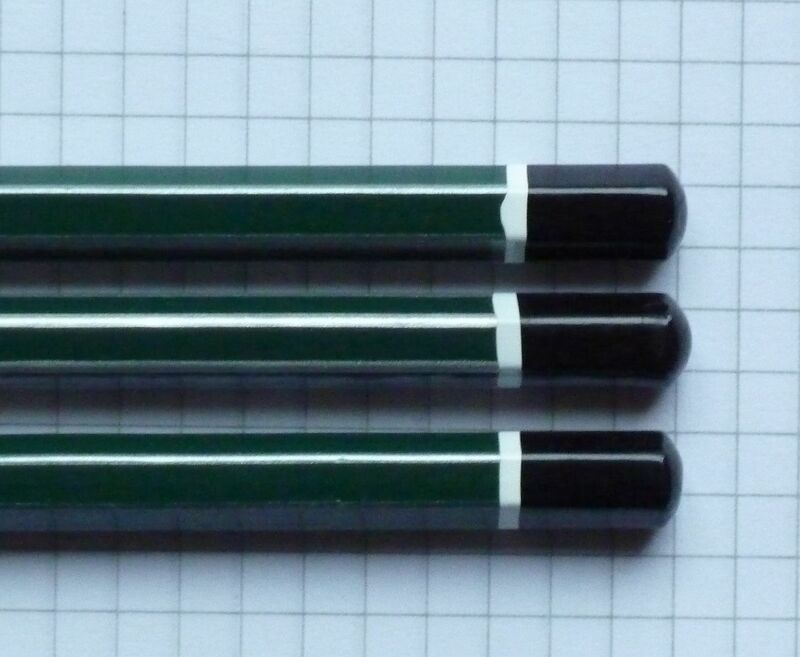 Woodcased pencils appear to be a sideline, and I suspect production of the Linex WP100 (pictured above, with apologies for the poor quality) is sub-contracted to another company. I can see no evidence either on the net or on the pencils themselves that the WP100 is made in Denmark; I guess it is made in China. Neither have I been able to find a review of the WP100 on the internet, so I believe this is the first online review of this product, which I bought from The Stationers That Shall Not Be Named some time in 2009. 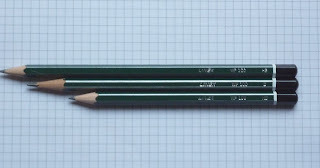 The WP100 is a standard office/school woodcase pencil and is available in five grades, from 2H to 2B. It is finished in a distinctive bottle-green lacquer, which is finished off with fine silver lines, a white band and a black end-cap. (Green is the Linex company colour.) It is the same length as a standard pencil, but is noticeably thicker in the hand; at least a millimetre or two thicker than a Staedtler Noris, for example. Whether this is due to the thickness of the paint used, or wider slat of wood, I do not know. You may have trouble locating this pencil, and I certainly know of only one retailer which carries it, but if you can find it for sale, this pencil may be worth a punt. 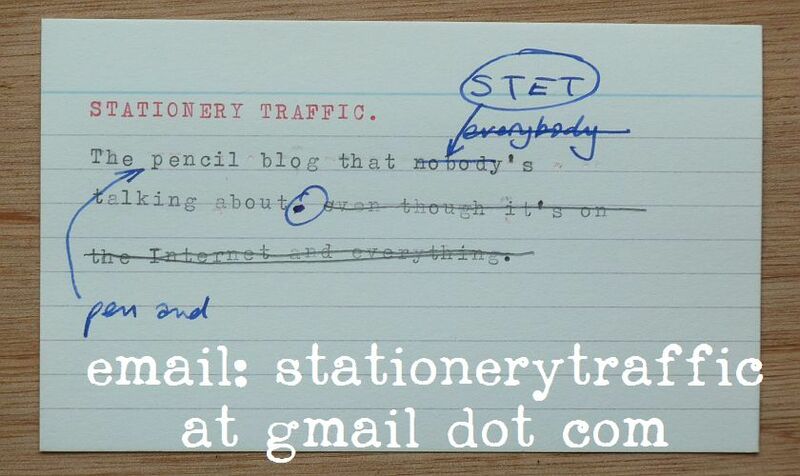 The WP100 is quite cheap, and occupies the middle ground in pencil cost: it costs GBP0.45 in the local stationer's. For this I got a pencil made from cedar, and one that will withstand sharpening with my KUM steno sharpener. However, after a few days using this exclusively at work, I found a number of drawbacks with the WP100. First, the finish is not as good as it could be. The paint may be thick, and show no sign of woodgrain, but the silver lines are unevenly applied, and the white band is at a slight angle on one of my examples. The white band is on another pencil is not even and there’s a bulge in the paint (see below). In the hand I found the corners dug into my fingers in a similar way to the Tombow Mono 100 I reviewed a while back, and the extra girth of the pencil contributed to the general discomfort of using this pencil. However the weakest part of this pencil is the lead. I have HB and B examples of this pencil. The B is actually not too bad; it is dark and writes well on paper, though it feels less gritty than the HB. The HB I used was more troublesome because there must have been a problem with mixing the lead. In addition to the grittiness of the lead on the paper, there were also what felt to be lumps of clay in the mix. The line left by the HB pencil occasionally became much lighter, and the lead harder. This was unfortunate because otherwise, it was fairly dark; perhaps as dark as the Stabilo 4908s I reviewed last year. Both erased well with my Stabilo eraser, however. So, the WP100 is a curate’s egg of a pencil: good in parts, bad in others. The unevenness of the lead is the deal-breaker on this pencil, which is a pity because with a higher-quality lead, this could be a true competitor to the established brands. However, I’ll be sticking to my Staedtler and Faber-Castell pencils. The World's Most Expensive Pencil Sharpener? ...and he even made it a long-point too. Happy New Year! I hope 2011 is an improvement over its predecessor. This time of year has special significance to me. My parents were from Scotland, where New Year celebrations are taken very seriously - it is called Hogmanay and you can read about it here. Every Hogmanay my parents hosted a party which began at midnight; much of New Year's Eve was spent cleaning the house before the party (a custom which I understand is also followed by the Chinese). The post-party clean-up would occur once people had recovered from the festivities. January is a month of looking forward: the nights begin to shorten again after the dark months of November and December, and the Christmas break is over. I've done very little other than eat and drink too much this Christmas as I have been unwell, but the enforced break has allowed me to recharge my batteries; I'm even looking forward to getting back to work next week. During 2011, I intend to continue posting from time to time on pencils and pens, with the occasional foray into typewriters and other subjects. I intend to post one or two typecasts from the Olympia SM3 once I can work out how to darken the text on scans, or obtain a replacement ribbon. 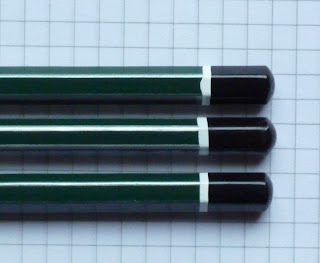 There are some pencils I have yet to try - still no Blackwings or Dixon Ticonderogas here for example, though the latter is now available at Cult Pens - so perhaps I can get my hands on those, even with the rise in VAT due on Tuesday. 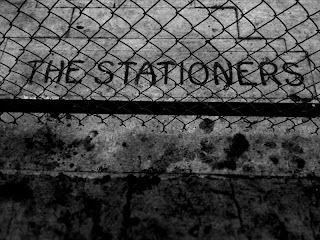 So, here's to the new year, and a new decade in stationery. Again, Happy New Year!